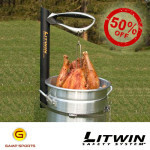 The unique Litwin Safety System makes turkey frying safer and easier. • Unique automatic locking mechanism reduces risk of the turkey dropping into the hot oil should you accidentally let go. • Safely and securely holds the bird for draining while you prepare the rest of your meal. • Fits most 30 to 40 quart frying pots—new or the one you have been using for ten years. LIMITED SUPPLY REMAINING – 50% OFF RETAIL PRICE!